Hong Kong director Jeffery Lau, the producer of Stephen Chow's Kungfu Hustle and co-founder of Jet Tone productions with Wong Kar-wai, brings his Chinese version of Michael Bay's Transformers to the screen. Metallic Attraction: Kungfu Cyborg, which opened in cinemas this week, is set in the year 2046, when robots are created to serve mankind. 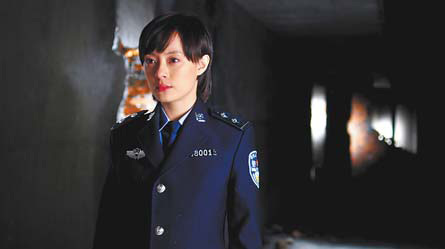 De Ming (Alex Fong) is among the first generation of androids to protect the police. Under the supervision of Xu Dachun (Hu Jun), De Ming trains in a remote village, where his real identity is not revealed. The plot thickens when De Ming's female colleague Su Mei (Betty Sun) falls in love with him, unaware he's a robot. One day De Ming and Xu Dachun are assigned to capture a runaway robot K-88 (Jacky Wu). After a battle K-88 explains his reason for escaping: He does not want to be a robot forever. The sci-fi romance is a departure from Lau's previous works. According to the director, the movie takes a new look at robots for people who are used to Hollywood heroes like Spiderman and Superman. A period drama centered on the Kangs, a rich banking family in Imperial China, it's the first feature by Taiwan-born director-writer Christina Yao. Based on a three-volume romance by writer Cheng Yi, the highs and lows of the Kangs reflect the profound social changes of the era. The film stars two-time Best Actor winner of Golden Horse Film Awards, singer/actor Aaron Kwok, along with Zhang Tielin and actress Hao Lei. A light-hearted romantic comedy by director Jin Yimeng, about a comic book artist Su Fei who schemes to get her fiance back after losing him to an actress. Paramount Pictures and Hasbro, whose previous collaboration was the worldwide blockbuster Transformers, join forces with Spyglass Entertainment for another extraordinary action-adventure movie.